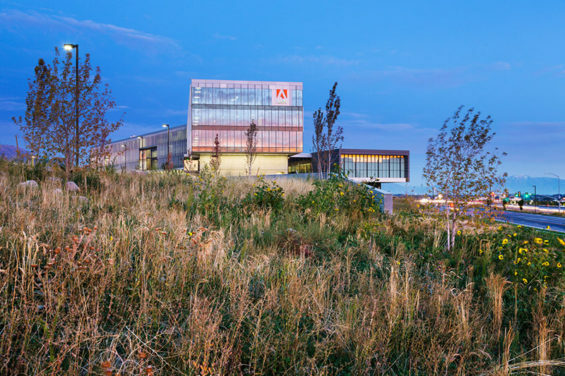 Adobe’s newest Metro Salt Lake City campus was selected on the planned lightrail line in the South Valley City of Lehi. Wallace Roberts & Todd (WRT) worked with architects, WRNS Studio to create a master plan to accommodate future growth of the 40 acre campus, with this project being the initial phase. The site development strategy calls for surface parking serving as a potential land-banking mechanism to be eventually replaced by buildings or more compact structured parking. The first phase included the campus’s first office building with central public functions of arrival lobby, an employee café that features locally grown food, recreation — including a full NBA-sized indoor basketball court, service and central public atrium space with associated circulation, parking, arrival courts and outdoor gathering and recreation uses. A sustainable ethos guided the development program. This can be seen in the buildings which are oriented for natural light and to direct views to nearby mountain peaks; in outdoor spaces that are programmed for recreational amenities for employees with special provisions for natural habitat creation, integrating the site the surrounding high-desert ecology; and in the stormwater system which collects runoff from parking areas and streets in planted swales and filters pollutants and recharges aquifers. 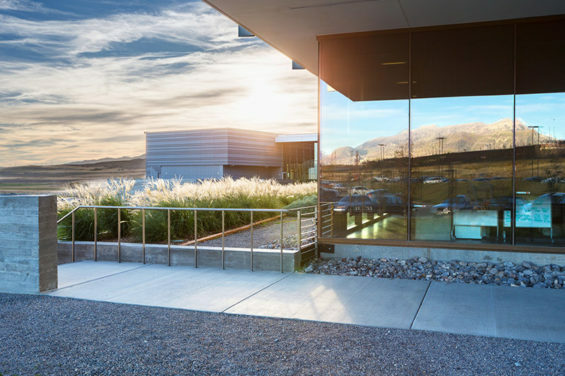 Part of WRT’s sustainable strategies for this new LEED Silver campus, was to reduce water consumption for irrigation by 58% from a baseline condition and to position the project for further water use reductions once native areas are fully established. 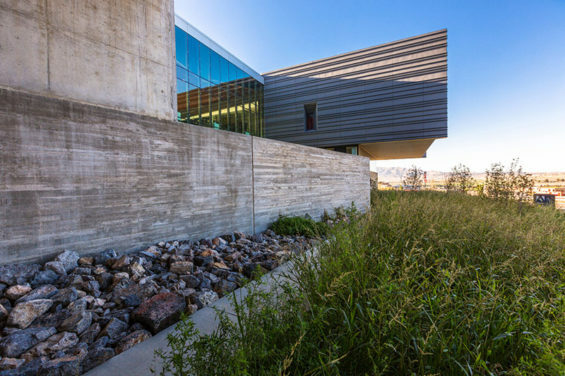 This was accomplished by designing significant portions of the campus’ landscape as a native, high desert plant palette. Ornamental planting, requiring higher levels of irrigation was limited to high-use, high-visibility zones near the campus’ major social spaces and recreational areas. 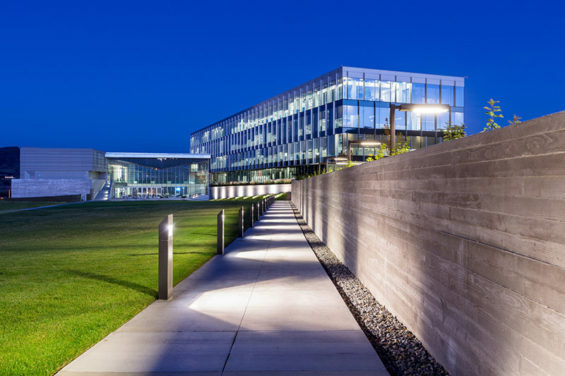 This approach allowed vast areas of the campus perimeter, parking zones and freeway frontage and rail frontage to be landscaped with a simple native palette of grasses and wildflowers on the ground plane and native tree groupings along drainage-ways. A more ornamental – but still drought-tolerant – grass mix was used for sculptural mounds running along key public spaces and through parking areas. In this way, as one looks across the site, the landscape is unified. Buildings and earth forms “flow” together as an integrated system to frame dramatic views towards surrounding mountains and de-emphasize views to the adjacent freeway. 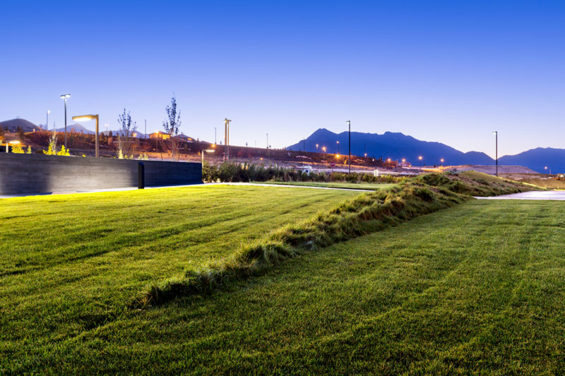 The landscape is also programmed to encourage outdoor recreational activities and indoor/outdoor relationships serving an energetic and creative work force. Landscape strategies limit lawn and ornamental landscape to a few central zones and quickly transition to large sweeping native xeriscape and grassland mixes. These landscapes enhance the plethora of outdoor activities that are offered including a multi-purpose quad, sand volleyball, basketball, loop trails and bicycle access & parking for mid-day riders. 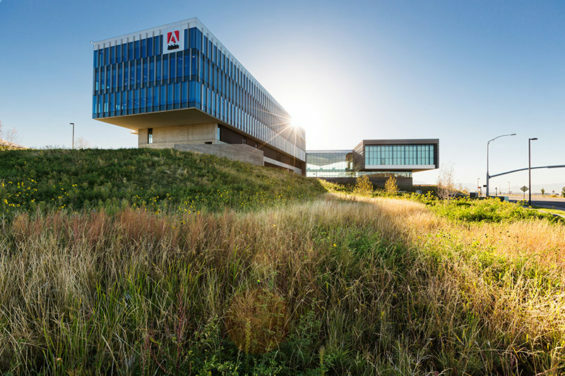 WRT helped Adobe accomplish many objectives including integrating the landscape with its surrounding ecology, encouraging outdoor recreational activities, and achieving a high level of sustainability. However in addition to the factors described above, WRT created a landscape that is lower in maintenance efforts than a traditional landscape; and will eventually save a significant amount of water as irrigation in extensive surface areas will be completely phased out. 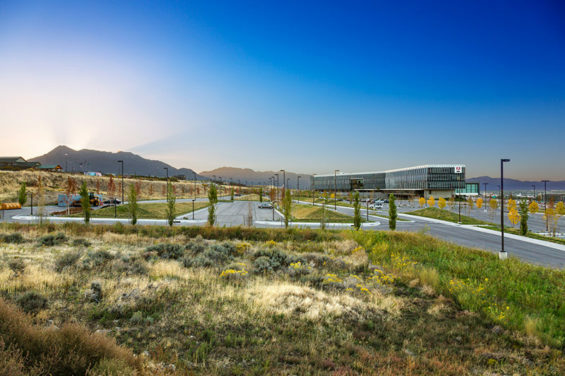 The Adobe Campus Landscape was awarded a Merit Award from the Utah Chapter of ASLA.